Cabbage rolls in a fraction of the time! This flavorful ground beef and cabbage skillet is made with lean ground beef, tomatoes, and cabbage. Serve this tasty skillet cabbage dish with rice or a tossed salad for a great tasting meal. In a large skillet or Dutch oven, heat the olive oil and add the onions cook 1 to 2 minutes until onions are softened add the ground beef and brown. Drain. Add the garlic and cook an additional minute. 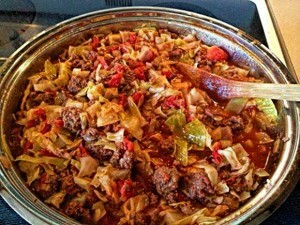 Bring to a boil, cover, reduce the heat and simmer about 25 minutes or until the cabbage is tender.